Restricted Countries Azerbaijan, Burkina Faso, Georgia, Greece, India, Iran, Japan, Kazakhstan, Kyrgyzstan, Macau, Macedonia, Montenegro, Nigeria, Russia, Slovakia, Slovenia, Taiwan, Thailand and Vietnam. Use the Double Bonus Bet for Wednesday’s Champions League matches by placing a mere £10 bet on today’s games. BetVictor Sports offers up to £10 with the Double Bonus Bet for tomorrow’s encounters: Atletico Madrid vs Barcelona and Benfica vs Bayern Munich. All you have to do is make a £10 wager on today’s quarter-final games (Real Madrid vs Wolfsburg and Man City vs PSG) to collect the Double Bonus Bet! Real Madrid are strong favorites 1.20 (1/5) to clinch a win tonight against Wolfsburg 15.00 (14/1), however the 10-time Champions League winners suffered a 2-0 loss in the first leg a week ago. The Spanish giants might win this encounter, but lose overall, as all it takes for Wolfsburg is to score 1 goal to make things a lot more difficult for the hosts. A draw stands at 8.00 (7/1). Man City 2.875 (15/8) will go head to head with PSG 2.50 (6/4) at the Etihad. The first leg ended in a thrilling 2-2 draw, and we’re sure tonight’s game will be equally exciting. Another draw 3.60 (13/5) may be on the cards, considering the level of both sides. Don’t forget to use the Double Bonus Bet on these two games. If the games today work out, you’ll receive up to £10 bet on the quarter-finals scheduled for tomorrow. Benfica 5.4 (22/5) will host 2013 champions Bayern Munich 1.7 (7/10), after suffering a 1-0 loss last week. A tie between them two stands at 4.00 (3/1). We expect this to be a one-sided match, since Pep Guardiola’s men enjoying marvellous form. And finally, Spanish rivals Atletico Madrid will square off against last year’s Champions League winners at Vicente Calderon. Barcelona are favorites to win 2.25 (5/4), but they’ve lost their impeccable form after succumbing to a 1-2 defeat to Real Madrid 10 days ago. Atletico have been assigned underdog odds 3.40 (12/5) but you shouldn’t discard them so easily. Another tie 3.50 (5/2) is also a high possibility. 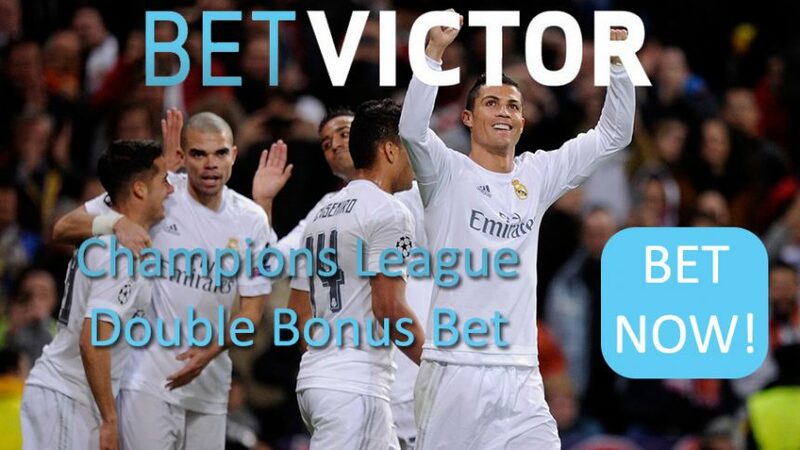 Collect £10 with BetVictor’s Double Bonus Bet on Champions League quarter-finals tonight!